So, this will be a quick post. 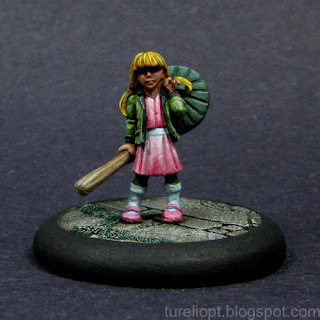 This was done for the OzPainters Challenge #3, where my least painted colour is apparently pink. This model is TINY! It's a 30mm base she is standing on, so that shows how short she is. I based the colour scheme slightly on Penny from Inspector Gadget. Because I'm old, and thought that was fun. Anyway, onto the pictures! Putty and Paint - Here!